If Goldie Locks was a millennial, her "porridge" would likely be poached eggs, as finding a fluffy poached egg that is "just right" is a delicate and temperamental process. On early mornings, eggs are the ideal breakfast: quick to cook, packed with protein to keep you full, and loaded with B vitamins and vitamin D. They're easily customisable, go with practically anything you have close to hand. 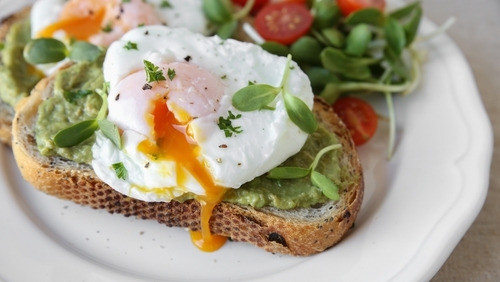 It just so happens that the most desirable of all - poached eggs - are typically the most difficult to make. This recipe simplifies the process right down, without the hassle of swirling water or gauging temperatures when you're in a hurry. And just think how much better your office lunches are about to become. Fill a one-cup microwavable bowl or cup with ½ cup of water and add in half a teaspoon of white vinegar. Gently crack an egg into the water, using a smaller glass to be extra careful. Cover the bowl with a microwavable dish or plate and cook for 1 minute. The cooking time will depend on your microwave's wattage, so in a 600-800w machine you may need a slightly longer cooking time. Once the time is up, check the egg. You want a firm white with a yolk that still has some jiggle to it, to be sure it's a runny poached egg. Remove the egg with a slotted spoon as soon as the desired level of cooking is achieved, as the egg will continue to cook if left in the water.